Add beauty to many of your projects. These are manufactured according to your specifications in Color and Size. BULLION FRINGE - 2" Bullion Fringe, 3" Bullion Fringe, 4" Bullion Fringe, 6" Bullion Fringe, 9" Bullion Fringe, 10" Bullion Fringe. Bullion fringes, rayon bullion fringes, cotton bullion fringes, tassel, tiebacks, honor cords, cords with lip, chair ties, brush fringe, gimps, tassel fringe, trimmings. Bullion fringe is available in many widths and colors at wholesale prices. Bullion fringe can be used in a several ways including home decor, clothing design, quilt making and many more. Simply, bullion fringe instantly adds a touch of elegance to any quilting, design,banner, or decorating project. R285 2" Chainette Bullion Fringe @ 1.25/yard only. 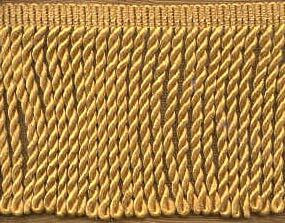 R285B 6" Chainette Bullion Fringe @ 1.55/yard only. R285A 9" Chainette Bullion Fringe @ 2.55/yard only. R285R 6" Shiny Rayon Thick Bullion Fringe @ $6.99 / yard only. Please specify your color requirements. R285RS 3" Shiny Rayon Thick Bullion Fringe @ $3.00 / yard only. When the correct number of items that you want to purchase is in your basket, simply click on "My Cart Positioned on the top of the right side screen".